A writer is supposed to write with a particular audience in mind. My editor tells me that just about every time she reviews my articles. I know. I know. I know. It’s something I’m sure I learned in grade school and have been striving to put into practice every time I sit down at my computer. When I type an e-mail, it’s to someone specific. A thank you note, it goes to someone specific. Why then, do I find it so hard to figure out whom I’m trying to reach through each of my blog posts? Can’t I just love to write, without having to please anyone other than myself? Of course not! Unless I’m writing in a diary, I hope to be interesting to somebody else. My problem is not simply a difficulty in identifying an audience. It’s complicated by my desire to not exclude anybody. When my kids were young, I enforced a house rule that “everybody plays together or your friends go home.” No hurt feelings; no one left out or sitting on the sidelines. Honing in on just one specific target audience is hard for me, because by focusing on one group, I’m afraid I may alienate the others out there on the fringes, whom I also care about. Fourteen years of experience with Vacation Bible School shows me that the ever important audience varies according to one’s perspective. I was given standard answers: VBS is where children come to learn about God in a fun, creative, inviting environment. They often make crafts, participate in games, eat snacks, learn dance moves to songs, and hear Bible stories. I’ve since discovered that, beyond those things, a great experience depends upon who hosts VBS, the curriculum they purchase or create, and the amount of energy people involved with the program are willing to put in. Each unique presentation is limited only by imagination, time and a budget. At St. Timothy Presbyterian Church, where I had that first year to relax, our VBS accepted children as old as sixth-graders and as young as three-year-old, potty-trained preschoolers. The kids were dropped off by their parents for a few hours each morning, Monday-Friday, for five days. Every child, regardless of denomination or church affiliation, was welcome. Older youth and adults led the young children through each planned activity. Unconventionally, the church absorbed all costs. Pastor Janet Noble-Richardson was adamant that money would not interfere with a child being able to attend. She insisted that the outreach would be free to the community. For some parents, VBS offered a perfect time to run errands without the kids in tow. When I arrived to register my seven-year-old son and nine-year-old daughter for their first VBS, I was surprised at the transformation my church had undergone. We walked through hallways full of artificial snow, life-size penguins, and elaborately painted backdrops. The kids weren’t just going to attend VBS, they were going to experience it through all five senses. It was impressive, but I really didn’t know all that I was missing until the next year, when I was recruited to teach the preschoolers. My twin boys were about to turn four and would be with me in class. I had been forewarned that the preschool teacher’s role was probably the hardest, due to the children’s short attention level, their possible anxiety in being separated from their moms, and the fact that our group didn’t rotate to other classrooms like the older children did. If nothing else, I was well-prepared with patience, a schedule of activities, and supplies to keep us busy. My room was staffed with three other parents, which gave us a ratio of about one adult for every four children. Yet, just minutes into our day together, my son was bit on the arm by a child I didn’t know. Eric cried. The boy cried. Eric bled and I held him on one hip as I tried to stick to the plan. I delayed a trip to the doctor’s office for antibiotics, because I had a class to manage. When I explained the incident to the boy’s mother, at the end of the morning, she wanted to know what my darling had done to antagonize her son. Day one couldn’t have ended soon enough. The following year, I volunteered to once again teach the preschoolers…and the director let me. Thankfully, everyone was fine, we enjoyed our time together, and I fell in love with my VBS audience of boys and girls. For nearly a decade, I took on an additional role and helped decorate the church in preparation for our guests. Other members and I painted, sewed, sawed, hammered, designed, glued and came up with intricate ways to amaze. We built outdoor classrooms: first a whale, then a hut, a burro to crawl through, even a ship. A stuffed lion, giraffe, buffalo, horse, cow, puppet theater, costumes for the closing plays. Heavy jobs often went to the men, but ladies weren’t shy about wielding hammers and staple guns too. Painting was popular for anyone, between five and seventy-five, who could hold a paintbrush or sponge. Forget the budget. Dozens of us donated time and money to finish our jobs. The only things slowing us down were our need for sleep, occasional illnesses and injuries. Here was a whole other audience, men and women of all ages working together, committed to serving. VBS was for us too. We formed unforgettable memories and lifelong friendships. Annually, I’m still involved with VBS at a different church. Now, the audience has become easier for me to single out. It’s expanded to include the grandparents who enjoy watching their grandkids perform a song, the retirees who step into new roles as musicians, camel herders, weavers and rope makers, and the visitors who are in awe as they admire and smile at the scenes I’ve helped create. VBS is for my friend who called to find out what she had missed on the day the children roasted marshmallow Peeps over a pretend fire. It’s for my current pastor who I recently found hiding in a storage room. 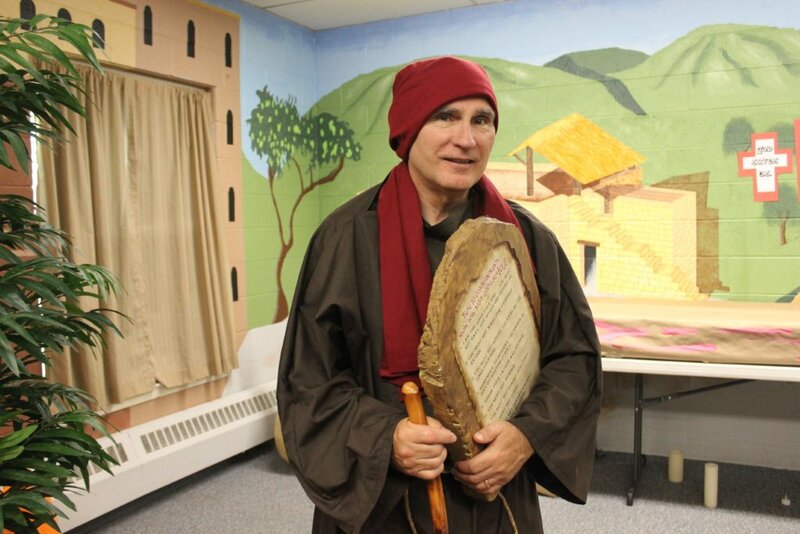 He was dressed as an ancient Israelite and eagerly awaited his entrance into a skit. It’s for everyone I’ve had the pleasure of dancing with as we sing praises to God. There are some people who don’t understand the hype. They think it’s totally absurd to spend time and resources on temporary decorations. They say that Vacation Bible School doesn’t require hours of cutting, pasting, hanging, and gluing. Hallways and classrooms don’t have to be elaborate. Buildings don’t need to get dressed up with palm trees and waterfalls or rocket ships and aliens. I’ll admit that all of that is true. Getting children excited about God and helping them get to know Him better are the goals. But, the cynics have a totally different perspective than I do. At least I’ve figured out Whom the extravagance is really for–finally, I’m sure of my audience. Didn’t know you were a blogger, Kelly. Thanks for the link. I’ll read you often. You’re writing for me! Steve, you were the one who suggested I start blogging in the first place, so I suppose I should have told you sooner. I’m glad you’ll be watching for my new articles and that I now have a target audience (you and my mother, for sure). I’m scheduled to post on the 16th of every month. Hope you enjoy what you read here on the site. BTW, I think the current picture is much better than the first one I had picked out. Your dilemma reminds me of a quote from Bill Cosby – “I don’t know the key to success, but the key to failure is trying to please everybody.” Finding your audience is important in order to establish your writing platform. Take comfort that as you provide for a specific audience, the people on the fringes will be equally provided for by others. Sound advice from both Bill and you. I love it. Thank you Sue. Thanks John. That’s a great way to look at it.